Spend small to deliver BIG! What experience do you provide to your customers? Reason #1 to support our small businesses: "Shopping at small businesses helps keep money within the neighborhood. 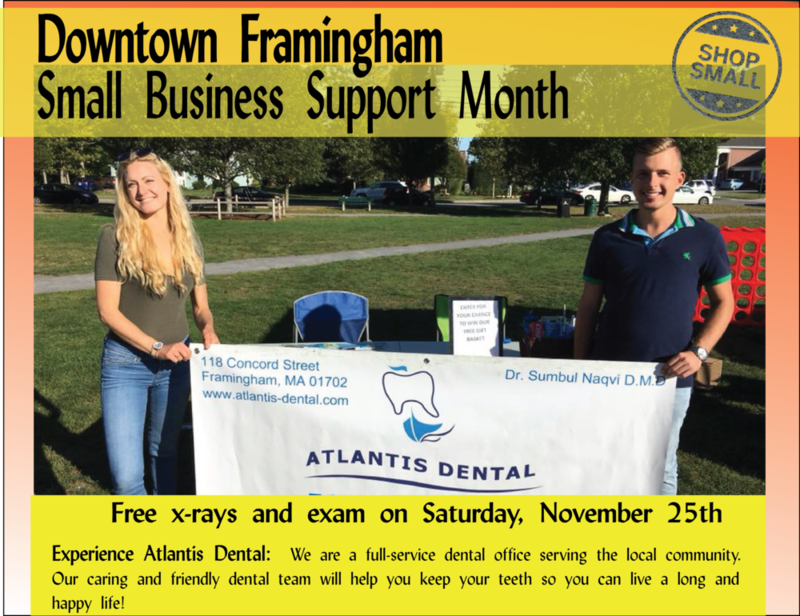 A series of studies by the research firm Civic Economics found that 48 percent of purchases at local independent businesses go right back into the community, compared to less than 14 percent of sales made at chain stores." Reason #2 to support our small businesses: "Money spent in the community will go back into it in the form of creating employment opportunities. According to the Small Business Administration, the 28 million small businesses in America account for 54 percent of all sales in the U.S. Plus small businesses have provided 55 percent of all jobs and 66 percent of all new jobs since the 1970s." It's Day 3 of Small Business Support Month! Reason #3: "Small businesses develop partnerships and strengthen ties with people in the neighborhood. Brick and mortar establishments serve as community hubs!" This is so apparent downtown! It's Day 4 of Small Business Support Month! Reason #4 to shop small: "Shopping at one local business helps other local businesses. By shopping at a business in the neighborhood, you’ll most likely stop by other independent retailers in the vicinity and create a ripple effect on the entire local economy." It's Day 5 of our Small Business Support Month! Reason #5: "You’ll be able to find locally made gifts that are perfect for your significant other or enjoy a one-of-a-kind specialty drink at the local watering hole." This is so true of our breweries, specialty coffee roasters, and art galleries! It's Day 6 of Small Business Support Month: Reason #6: "It helps keep communities diverse. By supporting small businesses, we’re making sure independent businesses thrive by adding to the cultural vibrancy and uniqueness of a community." Speaking of thriving, Congress Auto Insurance Agency has been thriving downtown since 1927! Stop in and ask Laurie the secret to this long-lasting success. It's Day 7 of Small Business Support Month! Reason #7 to shop small: "Local businesses make more local purchases requiring less transportation and usually set up shop in town centers rather than on the fringe. This generally means contributing less to sprawl, congestion, habitat loss, resource depletion and pollution." Today we're spot-lighting Creative Carpet, voted the best regional carpet store through Wicked Local Favorites! Check them out today! It's Day 8 of Small Business Support Month! Reason #8 to shop small: "Build Community! The casual encounters you enjoy at neighborhood–scale businesses and the public spaces around them builds relationships and community cohesiveness." Today's feature is Anastasia's Oven & Grill! Stop by to try their affordable, vast menu! You won't be disappointed! 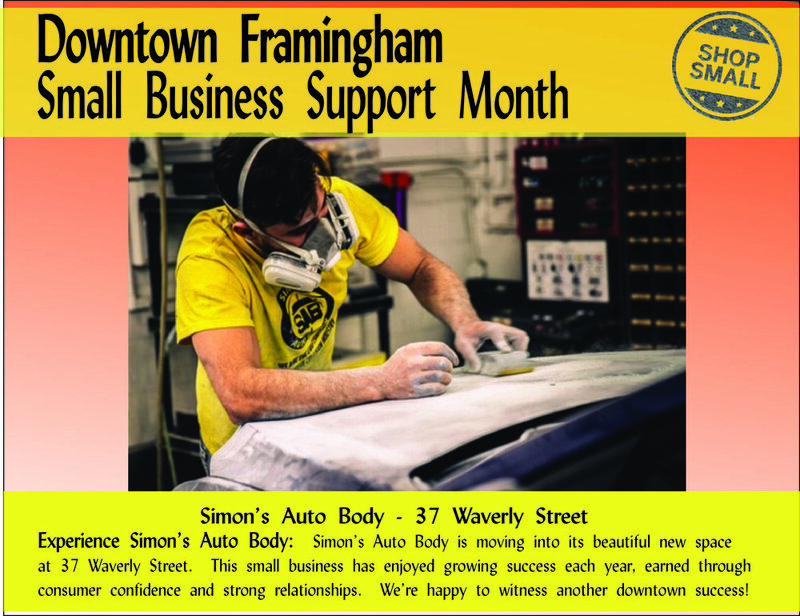 Small Business Support Month is a hit! Reason #9 to shop small: "Get real value for yourself! Reader surveys by the Consumers Union repeatedly show independent businesses beating their chain competitors in overall customer satisfaction (and often save you money)." Speaking of satisfaction, Mghightech School of Technology was founded in Framingham to help residents hone hotly demanded skills to land the next big job or promotion. Check them out today! It's Day 10 of Small Business Support Month. Reason #10 to shop small: "Lower Taxes! More efficient land use and more central locations mean local businesses put less demand on our roads, sewers, and safety services. They also generate more tax revenue per sales dollar. The bottom line: a greater percentage of local independent businesses keeps your taxes lower." Check out Party Flowers and Gaseta Photography. They are celebrating their 20th anniversary, and they can help you celebrate for any occasion! Stop by to say hello to Roberto Gaseta and Nubia Gaseta! Reason #11 to support small businesses: on Veterans Day, support small businesses run by Veterans! Today's promo is for Panza Shoe. Richard Panza is an Army National Guard Veteran who worked diligently to take care of his fellow soldiers just as he has taken care of your shoe needs for over 50 years! Stop by today! It's Day 12 of small business support month! Reason #12: enhance local democracy! Local ownership of business means local owners with roots in the community are involved in key development decisions that shape our lives and local environment. Today's promo is BRZ Insurance Agency, your Best Reassurance Zone in the MetroWest! Check out the beautiful office at 107 Concord Street! It's Day 13 of Small Business Support Month! Reason #13 to shop small: enhance the health of local residents! Research shows a strong correlation between the percentage of small locally-owned firms and various indicators of personal and community health and vitality. Today's promo is Exhibit 'A' Brewing Company! Check out this award-winning business that supports other local entrepreneurs, including musicians, yoga instructors, and food truck operators! It's Day 14 of small business support month! Reason 14 to shop small: they really give back to their community! Small businesses donate more than twice as much per sales dollar to local non-profits, events, and teams compared to big businesses. 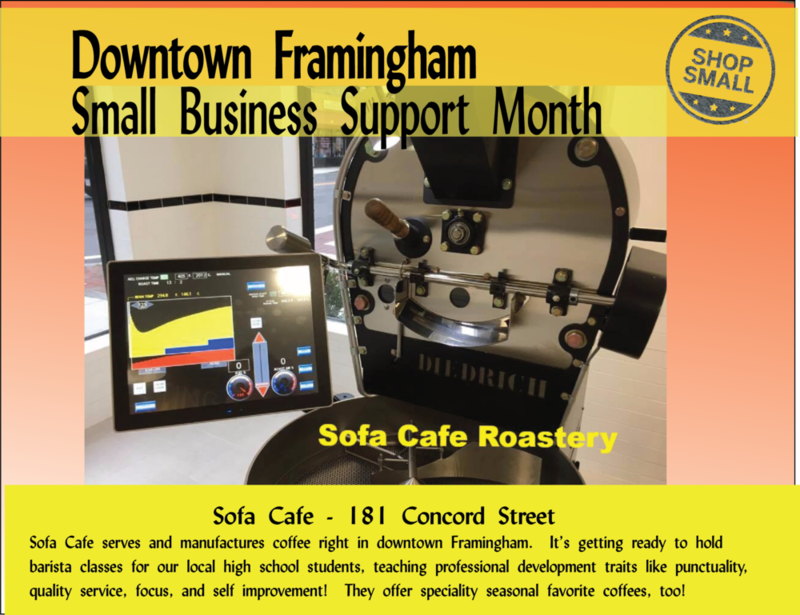 Today's promo is Sofá Café, a local business that always supports community workforce training! Stop by and try their seasonal favorites! 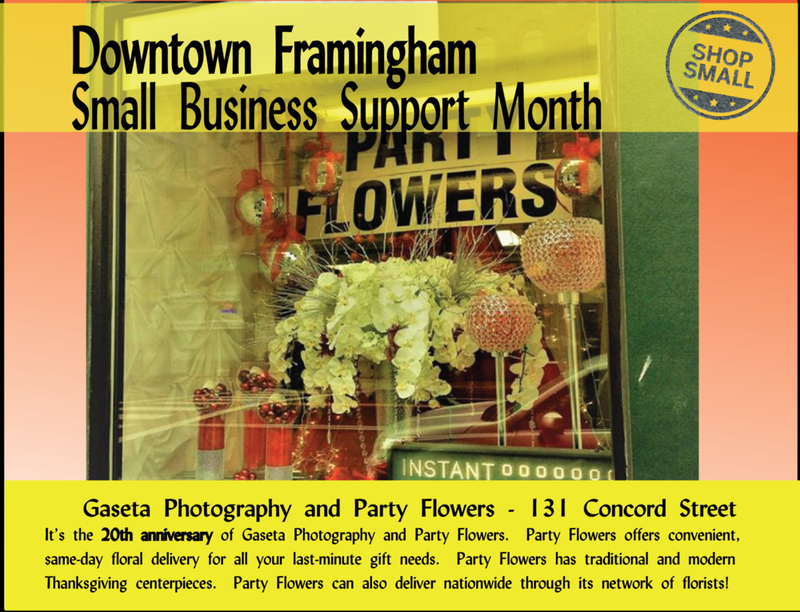 The Small Business Support Month continues! Reason #15 to shop small: "Local stores develop customer trust and enable you to try on and try out items before you buy — and get real expertise — saving your time and money." This is so evident at Atos Boutique, located at 100 Concord Street. It's Day 16 of Small Business Support Month! Reason #16 to shop small: "Small businesses shape our community's character! Independent businesses help give your community its distinct personality." Simon's Auto Body English has plenty of upstanding character, which has resulted in its own expansion into 37 Waverly Street. Check out the promo, below! It's Day 17 of Small Business Support Month! Reason #17: "STRENGTHEN YOUR LOCAL ECONOMY! Each dollar you spend at independent businesses returns 3 times more money to your local economy than one spent at a chain (almost 50 times more than buying from an online mega-retailer) — a benefit we all can bank on." Today's promo is Auto Bright Car Wash, a family-run business that has made downtown its home for decades! It's Day 18 of Small Business Support Month! Reason #18: "Small businesses often dictate their own prices to remain competitive, which means you can often find better quality items at good costs." Miss Chic is offering discounts up to 50% off, helping to ensure you're dressed-to-impress this holiday season! It's Day 19 of Small Business Support Month! Reason #19: "Small business owners are generally experts in their field and are better equipped to answer complex questions or provide innovative solutions for their customers." This is so true at CORE Fitness, where Claudia Chaves Cantalice will expertly guide you toward your healthiest, most fit lifestyle. See their special Thanksgiving promo below for Monday, 11/20, where they will accept donations to Daniel's Table! Small Business Saturday Promo: Purchase a 10 classes- Zumba- Booty Camp - Body Shred (punch cards) per $80.00 - Get 2 classes FREE! Why experience CORE FITNESS: "This is my favorite time of year for so many reasons (pumpkin EVERYTHING, warm soup, comfy clothes, the holidays, and the beautiful changing leaves!). It’s easy to set your health and fitness goals aside when things get so busy, but I urge you not to as this year comes to a close. Make an effort to pencil your workouts into your day and make them happen. Come January, you’ll be glad you did!" says Owner Claudia Cantalice. It's Day 20 of Small Business Support Month! Reason #20: "Small businesses tend to buy from other small businesses. When they purchase locally-sourced ingredients or products, they also contribute to their neighbor business’ success and the economic well-being of the entire community." For example, Tesoro Supermarket sells local bakery produced down the block at Neca's Bakery. 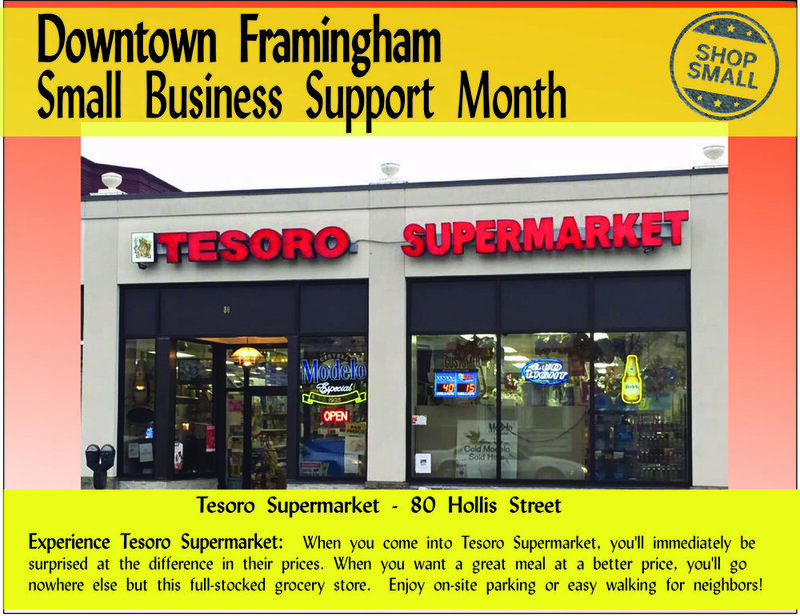 Check out the Tesoro Supermarket promo! It's Day 21 of Small Business Support Month! Reason #21: RESILIENCY! Local businesses are less susceptible to national downturns and more likely to work harder to stay open. 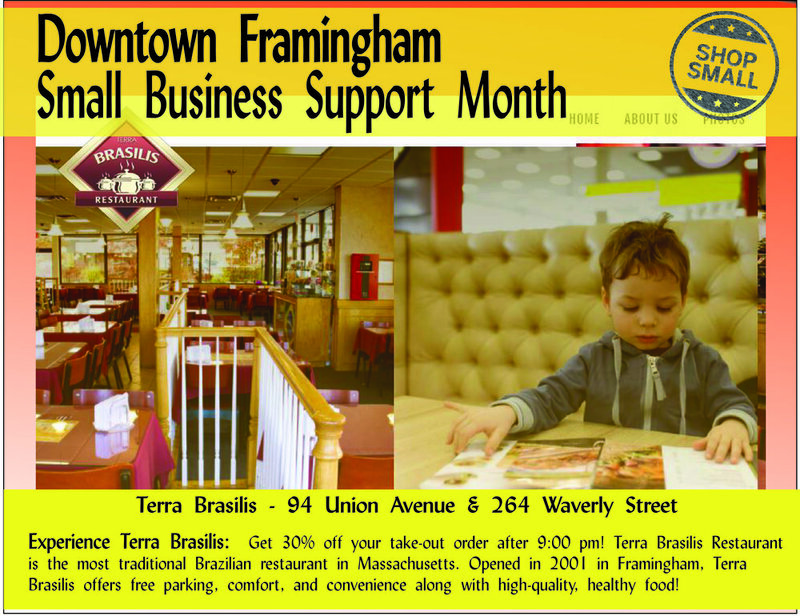 “Local ownership means that important decisions are made by people who live in our community and feel the impact of those decisions,” explains Chris Branson, co-founder of Keep It Local OK.
Terra Brasilis offers two vibrant locations in downtown Framingham. Join others to discover the best way to get a quick, healthy bite at this expansive buffet! It's Day 22 of Small Business Support Month! Reason #22: SUPPORT FUTURE GROWTH! "Experts agree on this reason—shopping locally is the best way to show pride in your city and help protect the businesses that make our city unique." It's Day 23 of Small Business Support Month! Reason #23: BUY WHAT YOU WANT - NOT WHAT SOMEONE ELSE WANTS YOU TO BUY! "A marketplace of tens of thousands of small businesses is the best way to ensure innovation and low prices over the long-term. A multitude of small businesses, each selecting products based not on a national sales plan but on their own interests and the needs of their local customers guarantees a much broader range of product choices." For a broad range of jewelry and top-shelf merchandise, visit our local jeweler, Imperial Jewelry. Check out all the latest holiday specials!! It's Day 24 of Small Business Support Month! Reason #24: ENCOURAGE LOCAL PROSPERITY! "A growing body of economic research shows that in an increasingly homogenized world, entrepreneurs and skilled workers are more likely to invest and settle in communities that preserve their one-of-a-kind businesses and distinctive character." Rece's Pieces is extremely distinctive. This is the only African-American owned barbershop in Framingham, and it offers international styles! Stop by and say hello to Trevor! It's Day 25 of Small Business Support Month! Reason #25: WELCOME NEW BUSINESSES WITH OPEN ARMS! When a new, small business opens, the local community cannot wait to meet the owners, who often are just as excited to display their personal touch. Join us at 5 pm on Saturday, November 25th for the GRAND OPENING OF Tax Advisor with business owner and local leader Thiago Dias!